Recently one of my clients, Valentina*, received not one, but two, deferrals in the same day. Pointless to state, it was a rough and emotional few hours. It was not unexpected that she received a deferral from one highly selective school. In fact, we had discussed this scenario as she submitted. The other deferral took her by surprise; it was from her “safety” school. A high achiever, planner, and detail-oriented student, Valentina had her highest dreams and her safety net put on hold in one fell swoop. I told her that these deferrals were good news. I don’t think she believed me, at first. So what is a deferral? 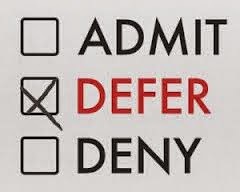 When applying Early Action or Early Decision, Colleges can admit, deny or defer. A deferral places the student in the regular decision pool of applicants. This means that the students record will be reviewed again, without prejudice, and their fate will be decided in the February March time frame, and notified in April. Where an offer of admission is a cause worth celebrating and a rejection means a good cry and a quart of Ben and Jerry’s, a deferral is no answer at all. In the immortal words of Jimmy Cliff**, deferred students are “sitting in Limbo.” After meeting early application deadlines, the student is left waiting for an additional 2-3 months for an answer to their application. 1. The applicant is in the bottom of the percentages in grades and/or scores of traditionally admitted applicants for that particular institution. 2. The student has not demonstrated enough interest in attending the school. Many small schools look at demonstrated interest as a determining factor in ED and EA decisions. 3. The school has had a banner year in applicants and can be picky or pickier. 4. There was an overabundance of applicants with similar demographics. Deferral is no fun, wears on even the most patient student, and brings with it an entire new set of competitors against whom you will compete. So how is it that deferral is good news? Deferral is good news because it means YOU ARE STILL IN THE GAME. Ask anyone who has been denied from a college if they would have preferred to be deferred and reconsidered with more information. Invariably, the answer to that question would be an emphatic YES. So what should you do if you are sitting in deferment limbo? After you put down the bag of double stuff Oreos revisit schools from which you applied but haven’t heard. Take some time to do some soul searching on whether or not the deferred school is a best fit. If your heart still says “go for it” proceed with these recommendations. 1. Send an email to the Admissions counselor for your area reaffirming your desire to attend this particular school. If this is your first choice, restate that it remains so. Ask the counselor what would they like to see improved or in more detail. In other words, ask specifically what you can do to make their decision to admit you easier. Realize that this gives you the opportunity to affirm that you are a great pick for this school; reassert that your presence on that particular campus can be positive and beneficial to both you and institution. 2. Submit your midterm grade report. If you have been following my blog or Facebook page, you will know that keeping your senior year grades up is important. It is important for this very reason. Good grades in increasingly difficult courses throughout your 4 years of college will reinforce that you are capable of performing on college level. 3. Many schools will allow for additional recommendations and information. Take a moment to ask teachers and counselor to readdress your recommendation. Ask a new teacher for another recommendation. Ask your coach, boss, or peer for one also. Do you have a friend who is currently successfully attending that particular school? Ask them to write you a peer recommendation and drop it off at the admissions office. 4. If you did not interview, and the school allows for interviews, ask now for one. Many schools will do remote, skype, or local alumni interviews. 5. Maintain demonstrated interest. Visit campus again if possible. If it is not possible, choose to interact with the admissions office, asking questions and seeking information on programming and campus life. But beware; there is a fine line between demonstrating interest and being a nuisance. 6. Unfortunately, for most students, retesting the SAT or ACT at this point in the admission game is not possible. Standardized testing does not begin again until the late spring. If you did take it in January, then waiting for those scores and sending them (if they are higher) is also a great option. Valentina should have no problem gaining admission to a number of great schools. Chances are she will be accepted at one or both of the schools to which she was deferred. For Valentina, and students like her, the limbo of deferment is not fun. But remember, sitting waiting an additional few months for the dice to roll can give students some extra time to search their soul- making them a stronger candidate in the long run.